Our gluten-free herb stuffing recipe is a good example of how gluten-free cooks can adapt traditional recipes to gluten-free recipes that are fit for a feast that everyone can enjoy. 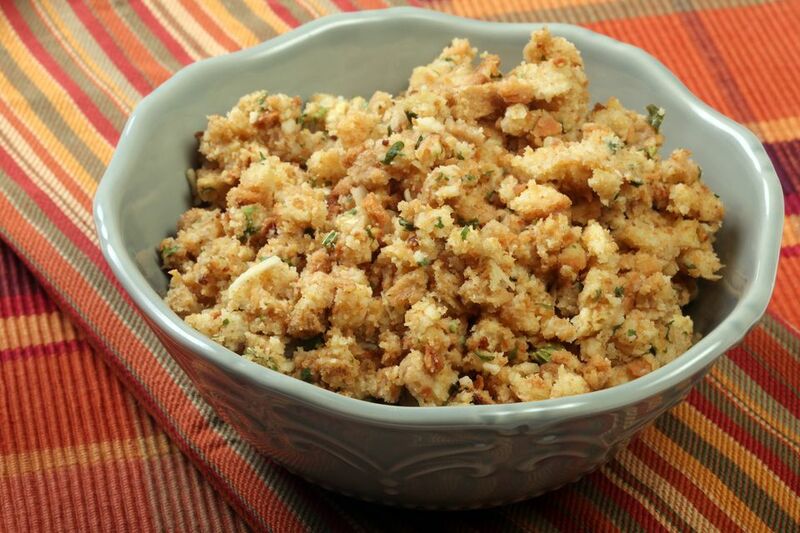 Try using our delicious gluten-free rosemary walnut bread in this stuffing recipe. It adds great texture and flavor to stuffing recipes. Spread the bread cubes in one layer on two large baking sheets. Bake for about 12 minutes or until cubes are dry, but not browned. Allow the bread cubes to cool. Place cooled cubes in a large mixing bowl. Melt butter in a large saucepan over medium-high heat. Add onions and celery and sauté for about 10 minutes or until onions are translucent, but not browned. Add herbs to vegetables and sauté an additional 2 minutes. Add vegetable-herb mixture to bread cubes and stir to mix. Pour lightly beaten eggs into mixture and stir to blend. Add salt and pepper and stir to mix. Add gluten-free chicken broth and stir to thoroughly combine all ingredients. If the stuffing is too dry, add more broth, 1 tablespoon at a time, being careful not to over-dampen or stuffing will be soggy. Transfer stuffing to a buttered 13x9 inch baking dish and bake for approximately 50 minutes or until the top is golden brown. If you like a heavily flavored stuffing, add 1 tablespoon of gluten-free poultry seasoning to bread cube mixture before baking. Test the flavors and moisture content. Melt 1 teaspoon of butter in a small skillet. Over medium heat, add 1 tablespoon of stuffing and cook just until golden brown. Taste and add more herbs, salt or pepper if needed. If the dressing seems too dry try adding another egg. Too much broth can make the dressing soggy.